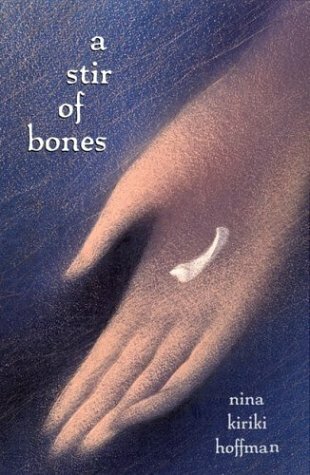 A Stir of Bones by Nina Kiriki Hoffman was a finalist for the 2003 Bram Stoker Awards. The novel is a suspenseful supernatural story about family abuse, friendship, and self-discovery. This novel is the prequel for the "Matt Black" series. A Stir of Bones is set during the fall of 1982 in Guthrie on the coast of Oregon. Susan Backstrom, the novel's main character, is the perfect all-American girl. At 14-years old, Susan is smart, beautiful, has wealthy parents, and is a student at the exclusive Heron Country Day School. Her life, however, is far from perfect. Her lawyer father controls her every move. Her mother is so weak and absent that she does not even make an appearance in the novel. Susan's main social contact is Juanita Rivera, the family's cook and housekeeper. One afternoon while studying at the public library, Susan overhears Julio, Juanita's son, and his friends, Edmund Reynolds and Deidre "Dee" Eberhard, planning a visit to an abandoned house rumored to be haunted. The house's attraction is less its ghostly atmosphere, than the fact that Trudie Adams, an intrusive classmate, believes that it is haunted and will not go near the house. In an unprecedented action, Susan interrupts the group and invites herself along. Julio vouches for Susan and his friend's accept her presence grudgingly. Lying to her father about another making a return visit to the library, Susan tags along to the house. The group discovers that the house is indeed haunted. There is a ghost named Nathan Blacksmith, a young man who killed himself in 1918 despairing of the deaths of his parents and believing he had contracting the deadly Spanish Influenza, but more importantly the house has an emotional life of its own. Susan is very helpful in relating to the house because she has developed "house sense" (the ability to read the emotions atmosphere of a house). Soon it is learned that each of the young people has their own independent reason for seeking privacy and the solitude that a haunted house might afford. Susan, however, can not reveal her reason. Soon Susan is falling in love with Nathan and the accepting atmosphere of the house and her new friends. With each visit, her risk of discovery by her father increases. Trudie Adams reenters the story adding fuel to this already volatile situation, when she discovers the group's hiding place and demands admission back into the group or she will reveal their illegal entry into the house to the police. Reading this book is like peeling an onion. It takes time a long time to discover the inner emotional pain of the various characters. While an astute reader should suspect right away that all is not well in Susan's home, the true nature of the family's dysfunction is slow to be revealed. Susan's gift of "house sense" is one I suspect many children of dysfunctional family's can identify with or wish they could possess. Trudie Adams is another interesting character. She also possesses secrets. She is lonely, selfish, and destructive. Nathan is the character in the novel with a message. He is truly a character that knows human despair - his parents are dead, he has no familial or financial support, and he believes that he has contracted a fatal disease - he is however the champion of holding on to life no matter the severe of life's problems. He is the firm voice against suicide. In the end, the novel focuses upon the destructive practice of keeping secrets and how friends can overcome the practice by challenging it. Nina Kiriki Hoffman is an award winning author of science fiction and fantasy. She has received awards for the following novels, The Thread That Binds the Bones (1993; Bram Stoker Award) and The Silent Strength of Stones (1995, finalist for the Nebula and World Fantasy Awards). She is the author of the "Matt Black" series including, two novella Unmasking (1992, nominated for a World Fantasy Award) and "Home for Christmas (1995, nominated for the Nebula, World Fantasy, and Sturgeon awards), full length novels, A Red Heart of Memories (1999, nominated for a World Fantasy Award); Past the Size of Dreaming (2001); and prequel A Stir of Bones (2003). Her other works include, Legacy of Fire (1990); Courting Disasters and Other Strange Affinities (1991); Child of an Ancient City (1992); and A Handful of Twist-Ties (1995); Common Threads (1995; which includes both The Thread That Binds the Bones and A Handful of Twist-Ties); Body Switchers from Outer Space (1996); Why I'm Not Afraid of Ghosts (1997): I Was a Sixth-Grade Zombie (1998); Star Trek Voyager #15: Echoes (1998); and A Fistful of Sky (2002). She lives in Eugene, Oregon. A Stir of Bones by Nina Kiriki Hoffman is an award winning story about abuse with a ghostly flair. The book is not unusually spooky or scary, and is appropriate for Grade 6 and up. Highly recommended.